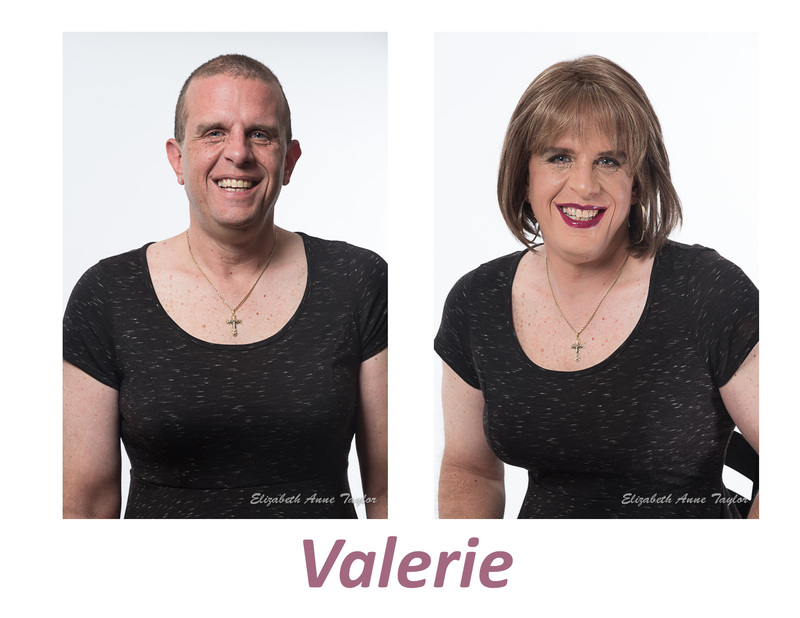 Valerie shows us the feminine power of makeup, hair, and posing in this MtF transformation. Leilani Rocks her Fetish Look! Leilani had her first makeover ever this week and absolutely loved it! We designed her look for going out from head-to-toe from my wigs and makeup and Leilani’s adventurous clothing and shoes. We loved the second outfit with the thigh high boots, animal print skirt, and see through top with pink bra peeking through. In fact, I encouraged her to embrace her look and go out to Freddie’s Beach Bar dressed in this slutty style instead of her more conservative dress. When we arrived at Freddie’s, the other guests’ responses were immediate and overwhelmingly positive! They loved Leilani’s look so much that they complimented her and requested photographs with her. Now that’s a successful outing to Freddie’s, my favorite neighborhood LGBT bar! Leilani looks even more beautiful after her Photoshop makeover to her traditional Elizabeth Taylor makeover. Leilani looks great with her makeover by Elizabeth Taylor. This is before any Photoshop edits but after Lightroom adjustments. Chris created her new look at her January makeover with Elizabeth Taylor. Chris loves wine, food, cooking, and hospitality so much so that she cooked and presented Anglo-Indian food for my February Trans-Women and Allies party. As a sommelier and wine educator, I paired the wines to her flavor-packed dishes to rave reviews. Check out the DC Trans-Ladies Meetup Group to find out about and RSVP to my parties. Create your Spring Makeup Look at my Next Makeup Party! 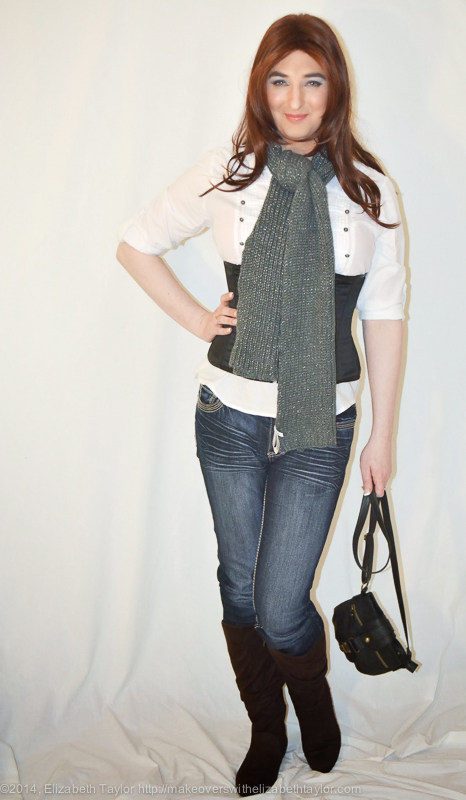 Allison selects a subtle, daytime look that would look perfect in spring! Create your spring makeup look at my next makeup party! Make those eyes pop with spring colors, feminize your face with contouring, and create full, pouty lips. Arrive with your foundation already done and ready for color. What: Create your spring makeup look, feminize your face with contouring, and create pouty lips! When: Saturday, March 22, 7:30 p.m.
Why: To look and feel fabulous while meeting other girls and having fun! How: Arrive with your foundation complete so you can start on your new color look right away! $10 donation requested to help cover expenses. RSVP: Email me to reserve your space as guests are limited. Having beautiful makeup on can make all of the difference! Come join us in developing your skills in applying color makeup and create your new look at my Makeup Makeover party at my trans-friendly studio in Alexandria! For this hands-on party, I’m only inviting six trans-women and allies so that we’ll have a safe and fun environment for learning about makeup. There is a $10 donation at the door requested to help cover expenses for this makeup party, and everyone will get a makeup makeover! You’ll have the opportunity to purchase your favorite products to add to your beauty collection. Come dressed as a woman or a man, passable or not passable. If you don’t have your own femme attire, you can borrow a wig, outfit, accessories, and shoes for the party with advance arrangement with me. You can also come early, starting at 7 p.m. and change here. Party will start at 7:30 p.m.
RSVP to me via email if you would like to attend, and I will send you the location details about two days before the event. If you would like more information, send me an email at Elizabeth.Taylor.Makeover@gmail.com. Or you can schedule a one-on-one makeup lesson or total makeover consultation! Here’s to being fabulous, ladies!!! 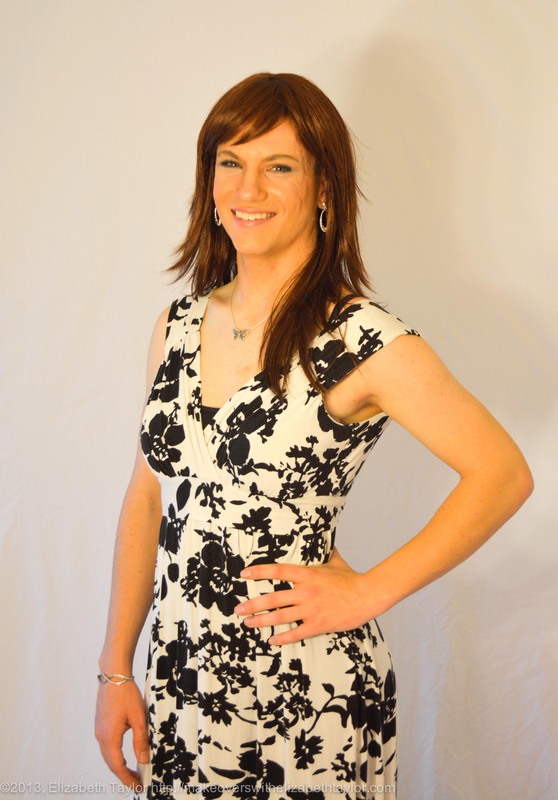 Elizabeth (Beth) Taylor specializes in total makeovers, feminization and transformations for MtF crossdressers, bigender women, transgender women, and transsexual women and has transformed over 250 girls. Beth loves working with first-timers and helping girls to embrace their femininity and beauty. 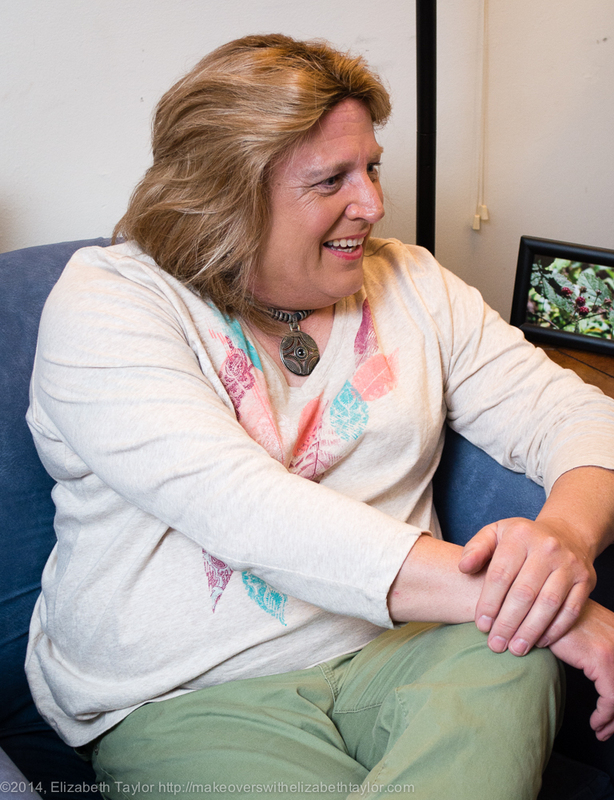 She helps girls grow their confidence and get involved in the DC Metro Area trans-women online and in-person communities if and when they are ready. As a birthday present to herself, Meagan treated herself to a Total Deluxe Makeover! In contrast to her whimsical sailor outfit, she models a cocktail party look including a little black dress (LBD) complete with soft pink accessories. She selects a dark purple smokey eye look and pink passion lips. Everything from Meagan’s LBD look except for her heart necklace is from Elizabeth Taylor’s studio wardrobe. At the end of her makeover and photo shoot, she changed into her blue jeans, black waist cincher, white blouse, gray scarf, and black boots for a birthday dinner at Freddie’s Beach Bar.